The Occupational Safety and Health Administration (OSHA) recently cited Newport Construction for various work hazards that were observed at a work site in Middlesex County. The Nashua contractor is now facing more than $30,000 in fines. These citations were handed over for various trenching dangers as cited by OSHA. 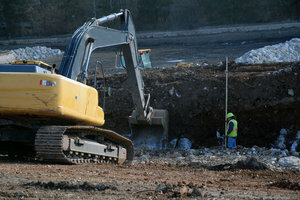 This Massachusetts work site is located at the corner of Network Drive and Route 62 on the Burlington/Bedford border. Safety and health inspectors with the Andover Area Office of OSHA happened to be driving by that intersection and job site, and saw workers working inside what appeared to be an excavation project that was not properly protected. With these allegations, an investigation was launched. The trench was deeper than 5 feet and was found to have been missing cave-in protection. This protection is federally required on trenches that are more than 5-feet deep. Our Andover workers’ compensation lawyers understand that this wasn’t the first time for violations. They were repeat violations, meaning that the company had already been busted by OSHA officials for these same hazards. For the additional repeat violations, the company faces close to $30,000 in fines. These first violations were noted back in October of 2008 also at an Andover work site. “An unguarded trench is an imminent danger situation,” said Jeffrey A. Erskine, an area director with OSHA. Any time that a trench is unguarded, it can easily collapse and workers can be buried under tons of debris and soil before they ever realize what’s going on or have time to react or even attempt to escape. A citation was issued to the company as a serious violation. This citation was written for neglecting to mark lifting slings with what should have been the maximum weight that the lift can safely carry. When workers don’t know what the weight limit is, they’re exposed to serious crushing dangers. When an employer gets a serious violation, it means that they should have known about the danger in the first place. It’s “serious” when there is a good chance that serious injury, or even death, could result from this danger. The truth of the matter is that excavating is one of the most dangerous things to do in the construction industry. As a matter of fact, there is an average of two workers who are killed each and every month in trench collapses. Each worker in these situations should have the proper safety equipment and their work site should be laid out in a safe manner. Some of the most effective protective systems for trenches are to make sure that they’re sloped for stability, that they’re cut in a way to create a stepped benched grade, and that they are supported by a system that is made of material study enough to handle the weight. Each trench should have a trench box to make sure that workers are protected.